I’m finally, riding in a hydrogen-powered Alstom Coradia iLint train through the German countryside. Not as quiet as the two battery trains, I’ve ridden, but that’s because It feels to me that the traction motors are crudely under the passengers and cardan shafts are used to drive the wheels! Battery electric trains with regenerative braking should be virtually free of any mechanical noise. Both the Class 379 and Class 230 battery demonstrators were almost silent. As electricity generated from hydrogen doesn’t appear to generate much noise, then a hydrogen-powered train can also be almost silent. From talking to fellow passengers, it would appear that the train has been very reliable in service. 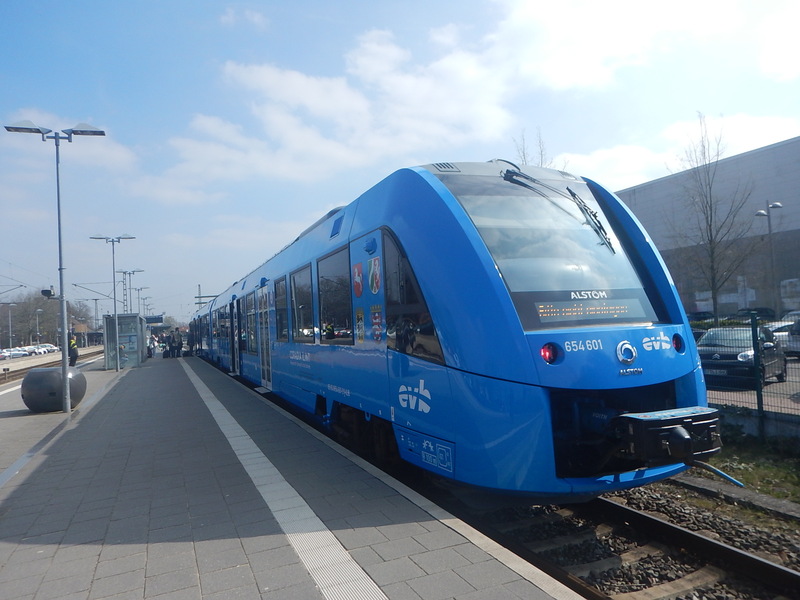 Alstom are proving hydrogen would work well in a train designed for that purpose, but updating a DMU with a mechanical transmission, possibly isn’t the way to go. I think that the Class 321 Breeze train will be quieter and faster. 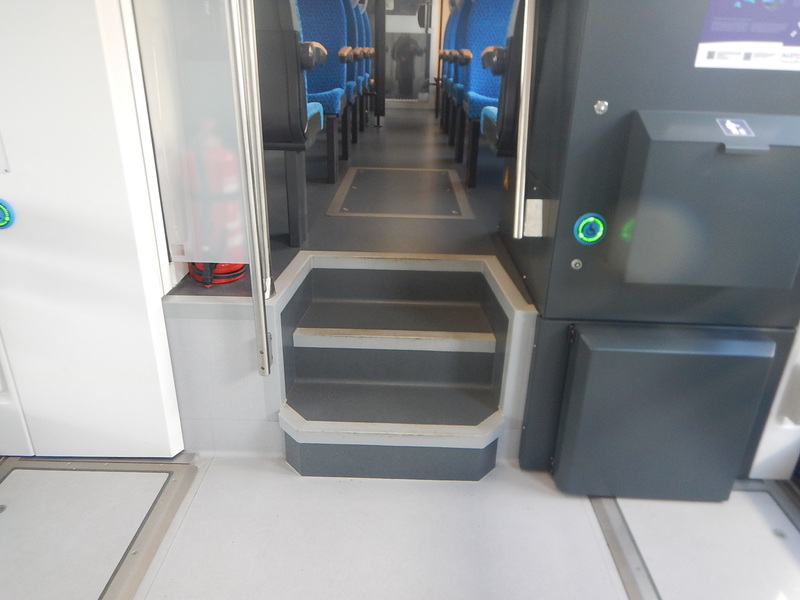 It appears too, that if Alstom’s conversion follows the design of the Class 321 Renatus, the train will have a totally flat floor. Come to think of it, I can’t think of a train running in the UK, that doesn’t have a totally flat floor! The iLint, like the Lint has several sets of steps. These are not acceptable in a modern train, bus or tram. It is interesting to compare the iLint with the current diesel Lint 41s on the route. The iLint is faster and may accelerate better. The iLint is based on the bigger Lint 54, so it has more seats and two doors instead of one on each side of the cars. The newer iLint appears to have a higher quality interior. I feel that the iLint will be quicker on a real.route. Currently, to go between Buxtehude and Cuxhaven and back to Buxtehude takes around five hours. So that means the current hourly service needs five trains. But if the iLint could do a round trip in four hours, the number of trains would be teduced to four. If to increase capacity, all trains were pairs of iLints, the number of trains required would be eight. Supposing it was required to double frequency, this would mean sixteen trains would be needed! And how many trains have been ordered? Sixteen! When Bombardier created the Class 379 IPEMU, they made certain that there was a lot of local publicity including a report on BBC Look East. I made a point of asking local residents about the train and no-one had heard of it. Although, I must say that students who regularly used the train, were very much in favour. This was the only information, I found about the train. It was only in German, which I can read,. But surely, such an important achievement deserves better publicity and explanation in perhaps German, English and French. 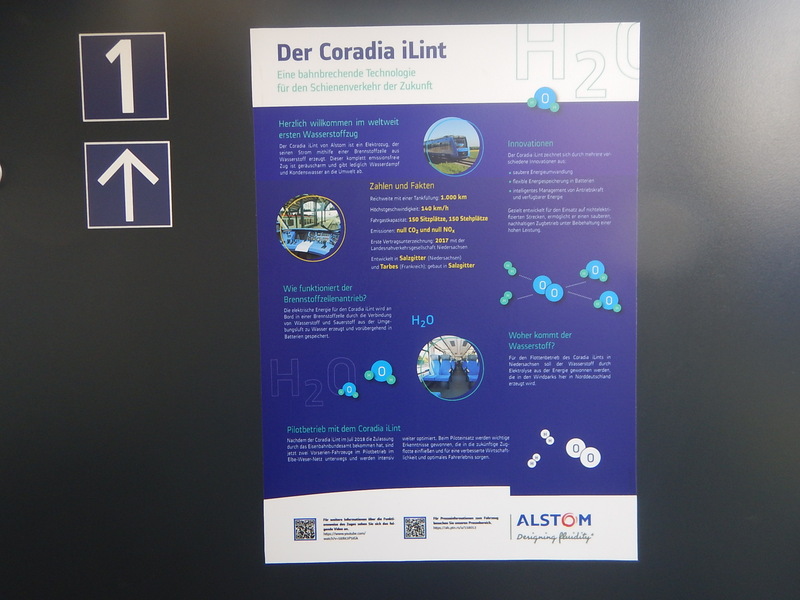 Alstom have proved that hydrogen-power is possible in a smaller train, suitable for regional routes. My reservations are totally about the Lint, which is an inferior train compared to many others that I’ve ridden in the UK and Europe. I wouldn’t like to use the train in a wheel-chair! The next generation of purpose-built trains with hydrogen power will be much better! In A Crossrail For Aberdeen, I put down my initial thoughts for Aberdeen Crossrail. Now that I’ve been to Aberdeen and travelled on most of the Aberdeen Crossrail route between Inverurie and Montrose stations, I can add more thoughts. I shall express my thoughts in generally a Southerly direction. Currently, this is a two-platform station on a passing loop. This picture gives a flavour of the station, which is Grade B Listed. You can just see, the rather elderly iron footbridge across the tracks. I suspect that platform usage will be as follows. 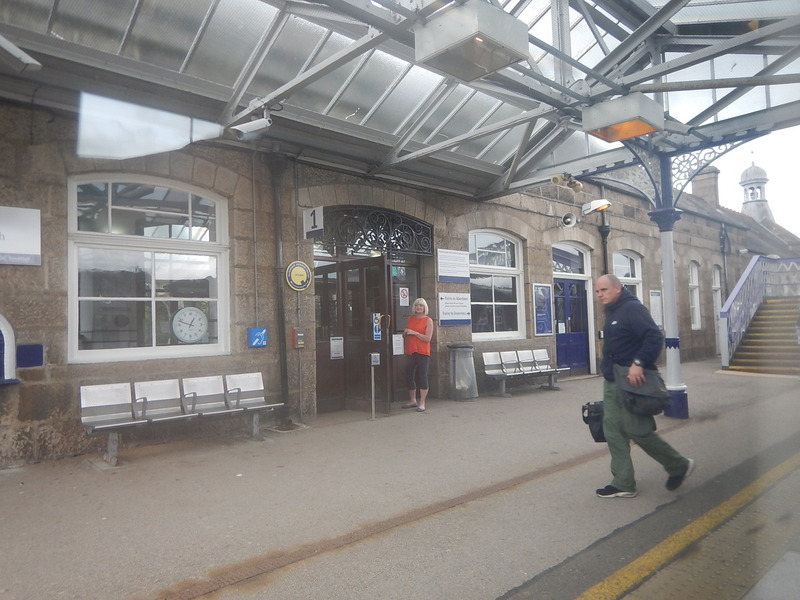 Platform 1 – All through trains to and from the West and Inverness. Platform 2 – All trains starting or terminating at Inverurie. If platform 2 is to be in regular use, then there will be pressure to improve the footbridge. Most of this section seems to be single track, with passing loops at Inverurie and Dyce stations. The only difficult bit is probably where the track goes under the new Aberdeen Western By-Pass. 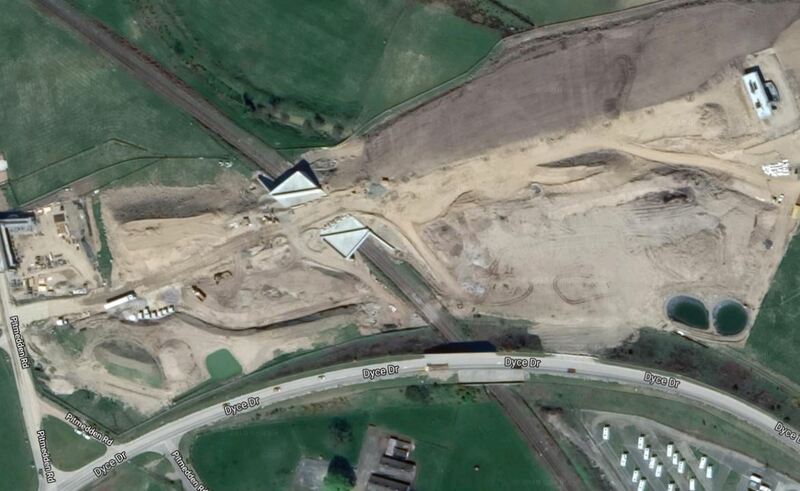 This Google Map shows where they cross to the West of Dyce station. The difficulty is not the engineering, but the insolvency of Carrilion, who were the contractor for the road. These pictures show Dyce station, where I changed from train to bus. I’m pretty sure that once the track is complete, Dyce station will only need a small amount of work. Aberdeen station is not only a transport hub with a bus station, but it is also connected directly to the Union Square development. It is certainly ready for Aberdeen Crossrail. In my travels up and down between, Aberdeen, Montrose, Stonehaven and Dundee, it surprised me, how many journeys were made on an InterCity 125. I’ve read somewhere, that one of the reasons, ScotRail are bringing in shortened InterCity 125s, is that passengers tend to use these faster trains on journeys like those between Stonehaven and Aberdeen. Although the shorterned InterCity 125s will be limited to 100 mph, their bags of grunt, will mean good acceleration and surely faster times between Aberdeen and Dundee, Edinburgh, Glasgow and Stirling. I timed the InterCity 125s at 100 mph on large sections of the route between Aberdeen and Montrose, as this picture of the SpeedView App on my phone shows. I think this means, that any trains working passenger services on the Edinburgh-Aberdeen and Glasgow-Aberdeen Lines must be capable of continuous operation at 100 mph. As Wikipedia gives the operating speeds of both lines as being this figure, it does appear that Aberdeen Crossrail will be a fast local service, very much in line with the performance of services from London to Basingstoke, Brighton, Chelmsford and Oxford. Initially, I suspect that ScotRail will be using Class 170 trains to provide the stopping service on Aberedeen Crossrail. 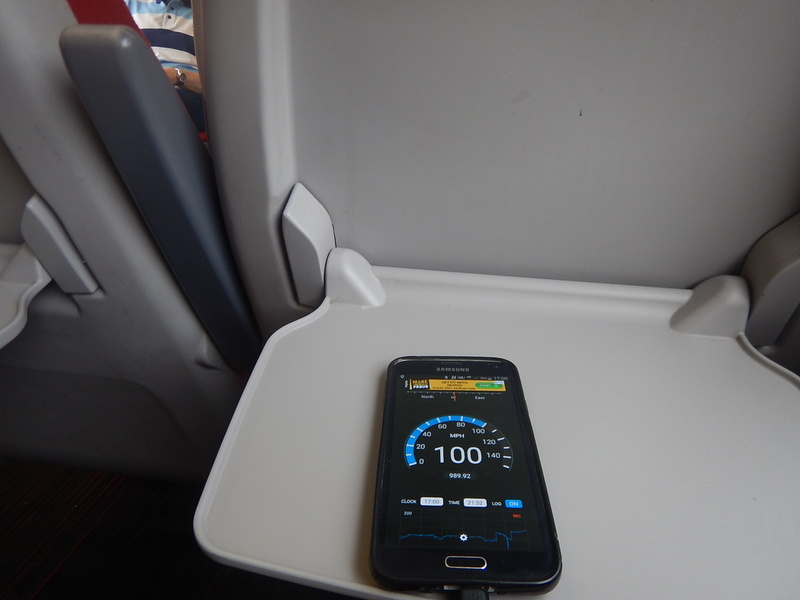 Class 158 trains could also provide the service, but their 90 mph operating speed may not be enough. ScotRail certainly have enough Class 170 trains, but I suspect that running two-car trains between Montrose and Inverurie stations, which stop everywhere will not have enough capacity. So a pair of trains will need to be used for each service. In A Crossrail for Aberdeen, I said this under Frequency Issues. The route of Inverrurie to Montrose has been deliberately chosen. Inverurie to Aberdeen takes around 23 minutes. Montrose to Aberdeen takes around 35 minutes. So with slightly faster trains and line speed, than currently used, it should be possible for a train to go from Inverurie to Montrose and back in two hours to include a few minutes to turn the train round. A two hour round trip means that a train leaving Inverurie at say 06:00 in the morning, will if all goes well, be back in Inverurie to form the 08:00 train. This means that one tph will need two trains, two trph will need four trains and four tph will need eight trains. These figures would be doubled if four-car trains were to be run on the route. I feel that four-car trains will be needed on all services on Aberdeen Crossrail, if some of the passenger loading I saw, were to increase. As it surely will do, if they have a more convenient and much better quality service. Passengers will also see the lots of seats on the shortened InterCity 125s, speeding past and will want some of that. Two two-car trains working as a four-car train can provide the capacity, but in my view they are not what passengers want, as they can’t circulate in the train to find a preferred seat. I also think, that at least two tph should run between Montrose and Inverurie stopping at all stations. This would require four four-car trains. ScotRail doesn’t at present have any suitable four-car trains. Will It Be Hydrogen Trains For Aberdeen Crossrail? Trains will need to be independently powered, as I think it unlikely that the route will be electrified. I’m sure that CAF, Stadler or another manufacturer, will be happy to supply a small fleet of four-car diesel trains. Class 769 trains, which are bi-mode could be used, but they only do around 90 mph on diesel. I am led to the conclusion, that the only suitable train available to a reasonable time-scale will be Alstom’s proposed conversion of a Class 321 train, running on hydrogen. The trains are capable of 100 mph using electric power. I would be very surprised if these trains couldn’t do 100 mph on hydrogen power. The new interiors fitted under the Renatus project, are a quality upgrade, as I said in A Class 321 Renatus. The trains could be available from 2020. There is plenty of wind in the Aberdeen area to generate the hydrogen. Aberdeen Crossrail will become a two trains per hour service using four-car trains. I wouldn’t be surprised if those trains are Alstom’s Class 321 trains, powered by hydrogen. I took these pictures of the interior of a couple of Northern’s latest Class 319 trains. The train companies certainly seem to be improving their refurbishments, as these posts show. Is This Really A Pacer In A New Outfit? Personally, I hope I stick around long enough to get a ride in the following trains, that are in the line for substantial rebuilding. And of course, I want a ride in one of Great Western Railway or ScotRail’s short-formation InterCity 125. Will We See Any Other Substantial Rebuilds? It would be unfair not to ask this question. I think it would be reasonable to say that if refurbishment of the quality that has been applied to Class 319 and Class 321 trains, then train owners and their engineers could probably bring the Networkers and Voyagers, up to scratch. If nothing else, batteries could be fitted to harness the braking energy and use if for hotel power on the train. Bombardier have hinted, they will be doing this to Voyagers and I wrote about it in Have Bombardier Got A Cunning Plan For Voyagers? I finally got to ride in a Class 321 Renatus today. Quite frankly I was impressed. The seats were more comfortable than those in a Class 700 train. There were plugs to charge a phone or a laptop everywhere. There was a new Universal Access Toilet. Generally, the trains also seemed to have more space. Will Alstom’s hydrogen-powered version of the Class 321 train have interiors as good as these?